Discover your voice as a songwriter and develop your skills. Our songwriting course will provide you with the tools to write well crafted lyrics and melodies over chords. It will also give you a grounding in basic music theory and story telling commonly used in popular songwriting. The course is open to those who do not play instruments and are new to writing, as well as more experienced writers, some of the best writers are not singers so this is not essential. Just a keen interest in writing great songs. You will examine the work of prolific songwriters, such as Diane Warren, Sia, Max Martin and many more, in combination with practical exercises and exploration of different music genres guided through by a professional songwriter working in the industry.This will develop your ability to analyse the structure of lyrics and melody and analyse harmony and rhythm and what makes a great song. By the end of the course you will have at least 2 complete songs to take away. There will also be an informal showcase, where you and your fellow students will be performing your songs to each other, either a cappella or with an instrument. We will also introduce you to the industry and show you how to not just chase the dream, but live it. What will be taught on this songwriting course? This course is suitable for all levels and those who possess a passion and curiosity to learn more about songwriting. Our tutors ask that you bring ideas in their preliminary stages as well as more developed songs you wish to work on. It is a great idea to bring an instrument if you work with one, otherwise just your voice and an open mind are the perfect accompaniment. All courses are taught within groups. Each week will begin with a thorough vocal warm up before going on to develop and apply key techniques and approaches to develop your songwriting skills. Your voice and creativity will develop each week and you’ll gain a sense of control and confidence when singing. Best of all, you’ll have a lot of fun, and meet like-minded new people. Developed confidence in their writing ability, improving expression and musicianship skills. Explored performing as part of an ensemble and as a solo singer. A deeper understanding of song structures, writing lyrical content and form. Shared their song within an informal showcase to fellow students on the final session. Students may wish to repeat Songwriting before moving onto Music Production or Level 3 courses at City Academy. 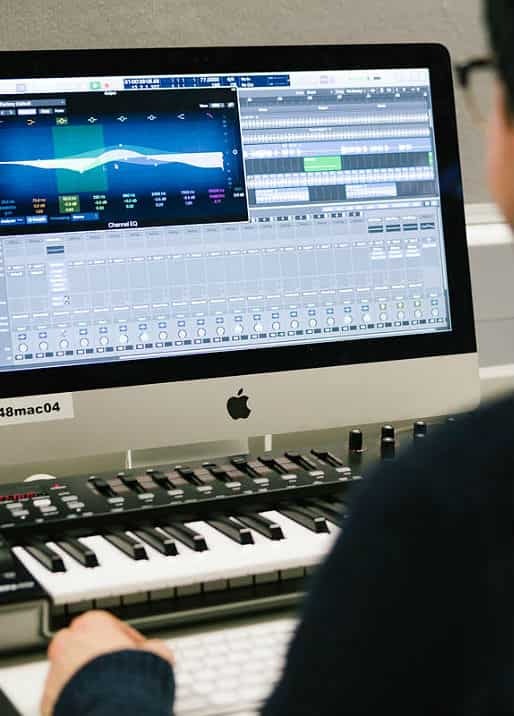 Music Production courses focus on the full music creation process, where students will have the opportunity to build a strong foundation to help realise their creative ideas. From production to mixing and recording techniques, students will gain a solid understanding of the full music production process. Level 3 singing courses focus on the further development of your chosen genre through a series of comprehensive vocal exercises. There is a greater focus on harmony work and dynamics. Students will have the opportunity to explore individual songs with personal feedback about vocal technique, performance and style.